We have been honored with one of the first Top-Rated Awards of 2017 from GreatNonprofits! 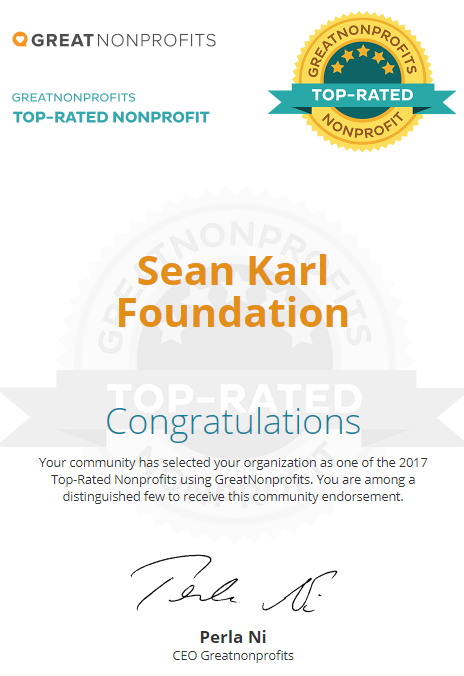 Sean Karl Foundation will be featured on the GreatNonprofits’ site, their 2017 Top-Rated List, and distributed to media and corporate foundations. The official 2017 Top-Rated List will be announced after October 31. Thanks to all who have helped us in our battle against Ewing Sarcoma this year! Go to GreatNonprofits to read our reviews and offer your own review!